There’s a reason I hug trees. Unfortunately I did not get to hug this one as you can see it is/was behind a fence. 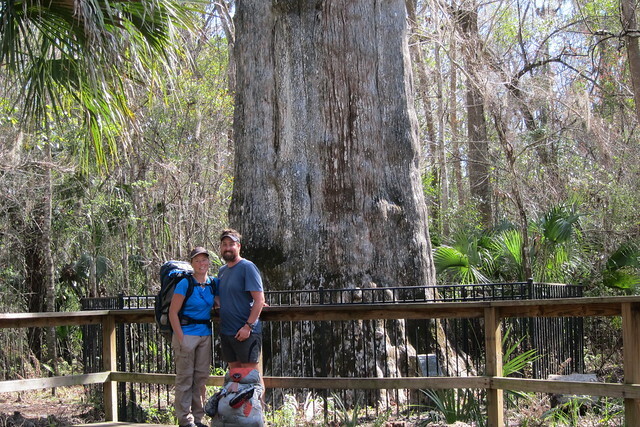 This is a photo of Chris and I on the Florida Trail last January, almost a full year ago, with The Senator. The Senator is no more. 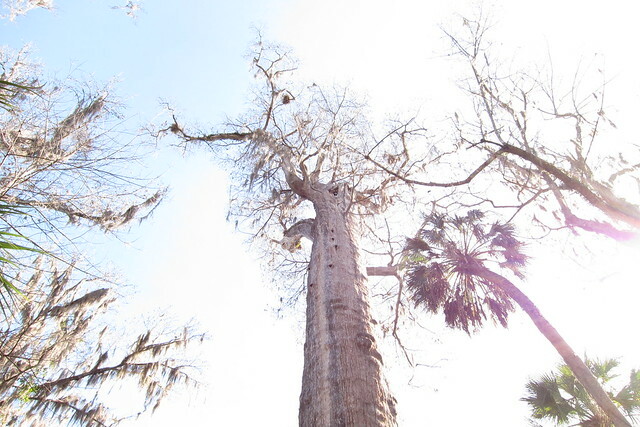 You see, this estimated 3,500 year old bald cypress tree, and 5th oldest tree in the world, burned down Monday morning. Burned down.. It’s almost difficult to fathom. 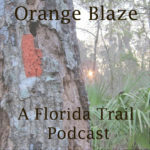 I’m part of a swamp hiking group on Facebook and I happened to check my email Monday morning with a notification stating that the tree had been burned. I quickly went to search for news stories, hoping it was a pathetic rumor, but in fact it was horrifically true. Somehow this tree had made it through Florida’s logging heyday. And if you look at that link, there’s a gigantic cypress being logged in the photos…devastating what we lost and didn’t realize! We took with it so many countless animals and plants—you can thank the logging of cypress and other hardwoods to the extirpation and probable extinction of the ivory billed woodpecker. I hugged several large trees last summer. You don’t have to hug a tree, but you should appreciate what you have in nature, because it could be gone. If it isn’t a developer building on an empty lot, it is a potential arsonist ruining something beautiful. I’m so glad we took the time to detour off the roadwalk we were doing last year on the Florida Trail and to stop in this park to look at The Senator and his neighbor, Lady Liberty. I only wish now that I’d sat there longer and enjoyed the tree a little more. So sad. And if it were arson, GRRRRR. It’s just awful. And to imagine all of the things that tree must have endured through its lifetime… fires, hurricanes, etc.